A sturdily bound set of 15 course modules that lies flat for ease of study. 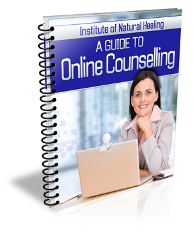 Detailed, practical information that guides you skilfully towards becoming a counsellor. 48 self-assesment exercises so you can monitor your own progress. 29 videos that explain each topic of the course in a way you'll understand. A useful case that keeps all your course material (not in the online-only edition). A confidential personal profile for you to complete. This helps you assess your goals, your strengths and weaknesses, and your progress. A study guide and planner that helps you organise your study. Self-assessment exercises. They occur throughout the course to help check that you can tackle each type of counselling. 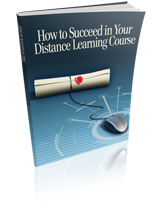 How to Succeed in your Distance Learning Course booklet (right). Tips and advice on how to successfully complete your course. This booklet is not available elsewhere. How to Write Assignments booklet (left). 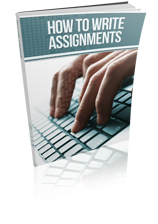 This booklet offers useful guidance on how to prepare your assignments. It's not available elsewhere. Question and Answer sheets for you to have your queries answered (not in the online-only edition). The contact details for your personal tutor. Details of how to contact other students. 49 Winning Ways to Promote your Service booklet. Great ideas to get you started. This booklet is not available elsewhere. You'll also get the Blackford Method and Blackford Pillars booklets with your course. The Blackford Method is included as part of the course. It is not available anywhere else. 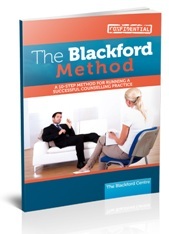 If you follow the Blackford Method, you will succeed as a counsellor, assuming that you also have the innate ability to counsel clients. 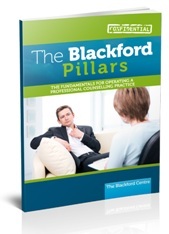 The Blackford Pillars are a set of 10 fundamentals that guide the new counsellor. They provide a basis for operating a sound and ethical practice. The Blackford Pillars are included in the course, and are not available elsewhere. Adopting the Pillars will allow you to run a professional practice properly. Online edition of the course. Get access to all the course modules and assignments when you register. Once you complete the course, we’ll give you three months’ free business mentoring. You’ll have a personal mentor who'll help you set up your own practice (if that's your choice). For three months after getting your Diploma you'll get one-to-one advice and support from an active practitioner. So if you're unsure on how to launch your own practice, this mentoring programme will put you on the road to success. And because it's all part of the Blackford Centre's course, it won't cost you a penny. This 47 page book contains complete step-by-step checklists for starting a successful business. A Diploma to frame and display on your wall. A reference from us confirming that you have completed the course. We'll send a free press release to your local newspapers announcing your success (if you request it). The right to use the post nominal letters Dip. WLC (BC) after your name. From time to time we may improve, amend or extend the items mentioned here.